Professional Journalist members of the Jazz Journalists Association are voting now for winners of its 21st annual JJA Jazz Awards. Nominees have been named in 41 categories of excellence in music and music-related media. Jazz Awards winners will be announced online at jjajazzawards.org on Monday, May 15, and will receive their engraved statuettes throughout the summer at their performances across the U.S. JJA members, Awards winners and nominees, and their supporters will gather to celebrate the JJA Jazz Awards at a ticketed event in New York City in early June, details to be announced. 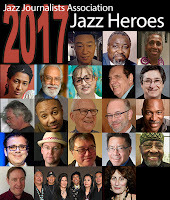 The Jazz Journalists Association has announced the 2017 "class" of JJA Jazz Heroes, 26 individuals in twenty locales around the U.S. who are being honored for their personal work in keeping jazz alive and thriving in their communities. Jazz Heroes are selected each year by community members in consultation with the JJA; the award recognizes the many kinds of non-musical contributions that are needed to keep the music going and bringing in new audiences. More on the 2017 honorees.